The Vesper Bell Handbell Ringers Sound Out! It’s early evening and the lights are on inside. I exit my car, walk up a few steps, and open the door. I know that I’m in the right place because the music seems to draw me inside. The piano plays as angelic voices chime through the hands of members of the Vesper Bells hand ringers. Here at Lutheran Church of the Cross in Shore Acres, the outside world seems far away as the sanctuary fills with the bells’ wordless message. Listen closely and you can hear it with your heart. Rehearsal ends and the ringers speak enthusiastically about their love for music and for the handbells. “We love ringing!” Sylvia Babus says, speaking for the other members who smile and nod in agreement. “It really helps keep your brain active,” says another choir member. It’s easy to feel the group camaraderie. On this evening six of the twelve members of the choir are present. They talk about the relationships they have made within the group and emphasize the importance of teamwork and community in creating beautiful bell music. 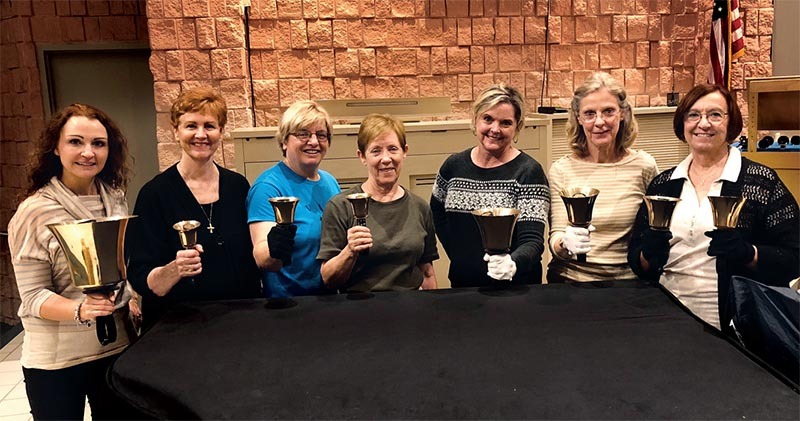 They are proud of what they do and always strive to improve through regular group practice and annual participation in the Florida State Handbell Festival. 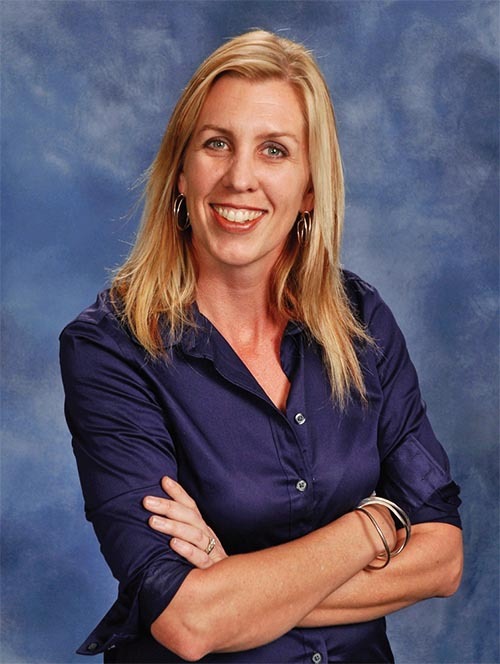 Rebecca Kasang, a Shore Acres resident, is director of Worship and Music at Lutheran Church of the Cross and oversees the Vesper Bells hand ringers. She has a strong commitment to sharing handbell music with the community. “Most people would not hear this beautiful music unless there was a bell choir at their church,” she says. 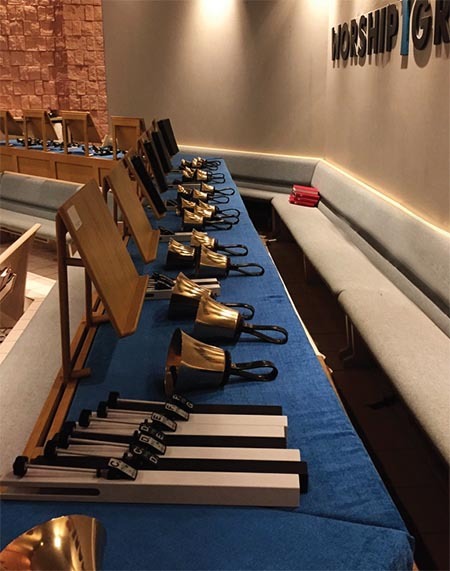 Here’s some interesting information about handbells… The bells are usually made of bronze and can weigh from seven ounces to almost 19 pounds. They also come in different sizes. With smaller bells, two or three can be held in one hand. The larger ones are held separately in each hand. The choir at Lutheran Church of the Cross has 61 bells, with a range of five octaves on the musical scale. Each bell corresponds to a musical note. Players are responsible for at least two bells, each of which sounds a different note. To play a handbell, a ringer grasps the bell by a flexible handle and moves the wrist to make the hinged clapper inside the bell strike. Players follow the musical arrangement and must ring their bell at the correct time. The arrangement also contains specific symbols for how the bells are to be rung. Music is made as all of these individual notes blend together. I leave the rehearsal feeling enriched by both the people and their music, captured by a vague sense of déjà vu. So many life memories can be associated with bells. I wonder if, over time, the sound of bells has somehow woven itself into our spiritual DNA? Throughout the world, bells have had an interesting history, dating as far back as the 5th century BC in China. During the Middle Ages, bells were thought to have special powers to drive away evil spirits. Church bells were often baptized to prepare them for this sacred duty. Handbells as we know them today are descendants of tower bells in England where ringers pulled ropes attached to each of five bells to create a melody. Rehearsals could really be annoying to neighbors who were probably glad when smaller handbells were developed. Finally, the ringers could practice inside! The art of handbell ringing blossomed from there, peaking in the 18th century. By the 1830s to 1840s, handbells had arrived in America. Today, the heavenly sound of handbells can be enjoyed in many churches and public spaces in our city. 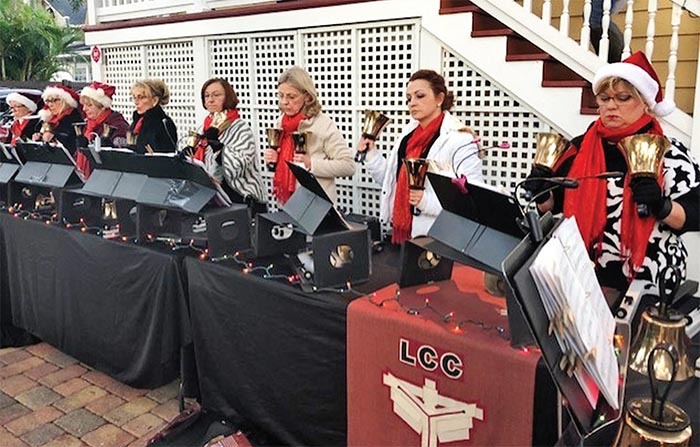 In addition to performing at the church twice a month, The Lutheran Church of the Cross Vesper Bells hand ringers also perform at community events, including HONNA’s annual Candlelight Tour of Homes and Anderson McQueen’s Tree of Memory event, both held during the holiday season. The bells continue to ring out. Don’t miss a chance to hear their heavenly sounds. 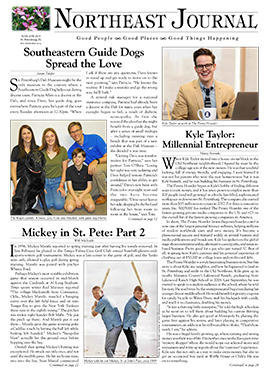 © 2018 copyright Village Green Publishing. All rights reserved.